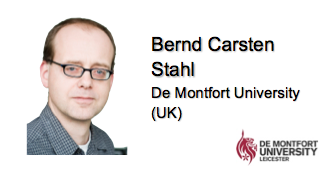 Bernd Carsten Stahl is Professor of Critical Research in Technology and Director of the Centre for Computing and Social Responsibility, in the School of Computer Science and Informatics of the Faculty of Technology at De Montfort University, Leicester, UK. GREAT “Governance of REsponsible innovATion” EU FP7 (coordinated by P. Goujon, Namur) February 2013 - January 2016. 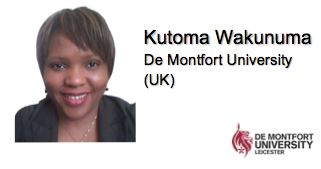 Kutoma Wakunuma has a PhD in Information Communication Technologies for Development and Gender. She has served as a Research Fellow on the ETICA project, which was looking at ethical issues of emerging ICT Applications. She has also worked as a Fellow on a CIGREF funded project which was identifying emerging ethical issues in Information systems as well as looking at governance arrangements in the field. This was in addition to researching the ethical implications of social media in Information Systems. Founder and Director of Signosis. She has a long and successful record in the ICT sector and in research management. Elena has worked for the Hellenic Telecommunications Organization (OTE), where she held various positions in key business units before joining the Research Programs Division, where she coordinated and participated in many large national and international collaborative research projects. She also worked as a freelance consultant and she was the Director of Research in ARACHNI Ltd, an Athens based innovative IT company, where she was responsible for the management and implementation of large FP7 research projects. Senior partner at Signosis. He has over 15 years research and consulting experience, working in the fields of employment, social protection, sustainability, corporate responsibility and regional development and has directed and participated in a large number of projects in related fields. In the past he held research and managerial positions in consultancies and in leading Greek scientific institutions on social and employment issues and was a senior advisor for ministries, government agencies and local authorities. Director of Legit (Laboratory for Ethical Governance of information Technology). He has authored numerous articles on artificial life, self-organization, thermodynamics, the complexity, biotechnology, genomics and also the connection between science, techniques, education and culture. His research fields concerned the history and philosophy of science (biotechnology and Technologies of information and communication) the epistemology and ethics of computing technologies, the governance theories (relation between rationality, reflexivity, ethics and governance), and the Internet governance issues. Trust and democratic governance. Social capital, institutional trust and action theory (provisional title). Goujon, P. & Lobet-Maris, C. 1/09/14. Martine's work is anchored on issues of democratic governance. She conducts research on participation and its issues, in politics as in the economic sphere, and is also involved in several European research projects on democratic governance, equal opportunities and business ethics. Expert in driving organisational change, she leads projects with companies and institutions in topics like public debate, participation, and participatory research. Se has been elected to the Board of Directors of the Research Committee 10 (participation, students organisational democracy and self management) of the International Sociological Association, and is currently Deputy Director of GIS "Public Participation, Decision and Participatory Democracy" ISHS Lyon (CNRS). Scientific coordination with Jean-Gabriel Contamin of the CONSIDER project. 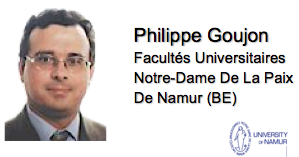 Scientific Coordinator with Rémi Lefebvre Project "Parthages" (democratic participation and Cooperative Research: Translation, Hybridization and Learning in Governance and Public Space Environment) funded by ANR. Scientific Coordination funded by the European House of Humanities and Social Sciences Lille AGORAS project. Expert in qualitative and quantitative methods, as well as in survey preparation and implementation. Emilie holds a Masters degree in Sociology (Université Lille 3) as well as a Masters in Survey Engineering in Social Sciences (Université Lille 3). Emilie has worked as a research assistant for the Project AGORAS, and has also contributed to the "Working conditions of teachers" collaborative inquiry with Frédéric Sawicki (Paris I Panthéon-Sorbonne) organised by the National Centre for Scientific Research (CNRS) and the Centre for Studies and Administrative, Political and Social Research (CERAPS). Member of the Scientific staff of the Institute for Technology Assessment and Systems Analysis (ITAS), in the areas of knowledge society and knowledge policy. His work focuses on the areas of science studies, risk analysis, sociology of technology and innovation, and intellectual property rights. 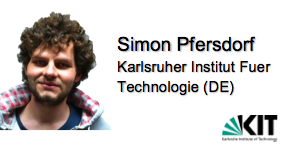 Simon has studies of political science with a minor in law and in peace and conflict research at Philipps-Universität Marburg, Freie Universität Berlin, and Charles University in Prague. German university degree "Diplom" in 2008. Executive Director at Euclid Network. He was previously Policy Director at the European Social Network, the European network for public social services, where he led ESN's policy & practice programme. He has worked with local and regional authorities, EU institutions and stakeholders on issues such as child poverty, deinstitutionalisation, leadership, quality and innovation. He has been working in the context of the Europe 2020 Strategy and the 'European Semester' for policy coordination across EU Member States. He is a graduate in European Studies of the College of Europe (Bruges) and Lancaster University. Policy Officer at Euclid Network. She has previously worked for ESSEC, a leading Business School in Paris and at the French Embassy in Sofia, Bulgaria. She was graduated in 2012 in European Studies from Sorbonne Nouvelle University in Paris and Charles University of Prague in European Studies. She has additional experience in leading EU-funded projects through her volunteering experience in a European Paris-based think tank. Communications Officer at Euclid Network. She graduated from the University of Sheffield in 2012 with a BA in French Studies, and has previous experience in communications and outreach for various civil society organisations, including Fair Trials International, Peace One Day and Cancer Research UK. Dr. Karen Bultitude is a part-time lecturer in Science Communication and Director of Research (STS) in the Department of Science and Technology Studies. She combines practical delivery expertise with robust academic research, especially in the areas of live (face-to-face) and digital environments. She also acts as an external consultant, particularly relating to delivering training courses and conducting project evaluations. Tonatiuh Anzures holds a BSc in Political Science and a MA in Public Policy. Currently on the third year of his doctoral degree, his research focuses on the scientific migration, its relation to science policy in Mexico, and the new logic and conceptualisation of the brain drain in the world. His main interests focus around Mexican and Latin American politics, public policy, the interactions between government and society, as well as education and science policies. 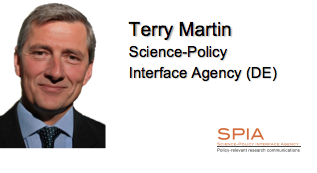 Terry Martin is founder of SPIA, an agency specialised in policy-relevant research communications. Based in Berlin, SPIA provides professional services to public institutions and research consortia with an international, interdisciplinary profile. Terry is a journalist covering politics, business and culture for media outlets in Germany and North America. Since 2008 he has also been aiding efforts to cultivate substantive dialogue among European researchers, policymakers, civil society organisations and businesses.